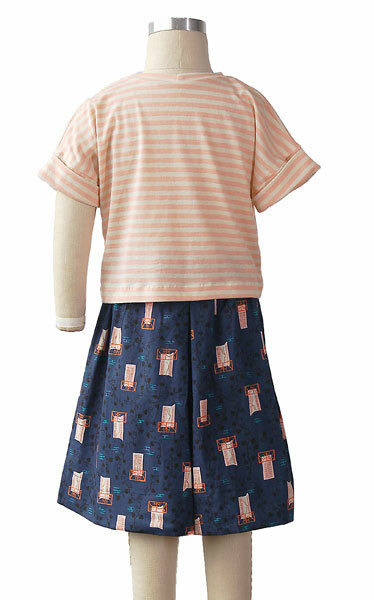 This pattern features wide, pleated culottes that look like a full skirt but can be worn for activities from biking to climbing on the monkey bars. 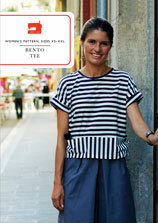 The knit top can be sewn up as a T-shirt with cute cuffed sleeves or a sweatshirt with pockets. Share your photos on Instagram with the hashtags #lunchboxtee and #oliverands. 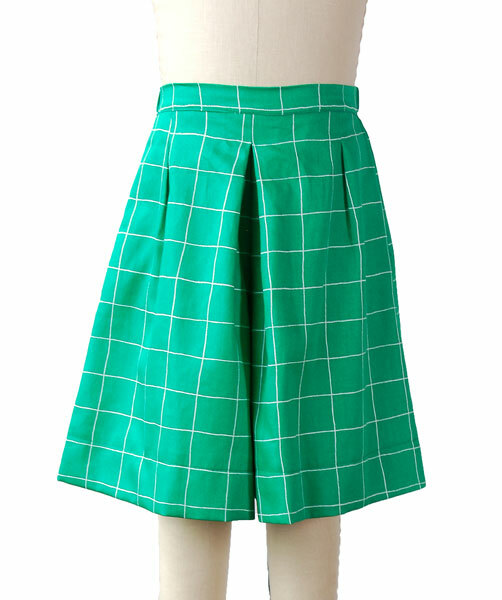 After successfully sewing this pattern, you will have developed the following skills: front-hip pockets, flat-set sleeves, knit fabric, in-seam pockets. Tee: Light- to medium-weight knit fabrics with at least 25% stretch like jersey, French terry, cotton fleece, velour, and waffle knit. 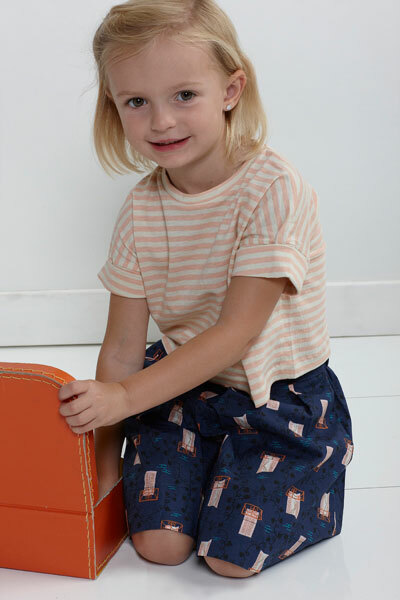 Culottes: Light- to medium-weight woven fabrics like quilting cotton, broadcloth, chambray, denim, fine-wale corduroy, twill, gabardine, and linen. Tee: Coordinating thread, lightweight fusible interfacing (knit or nonwoven). 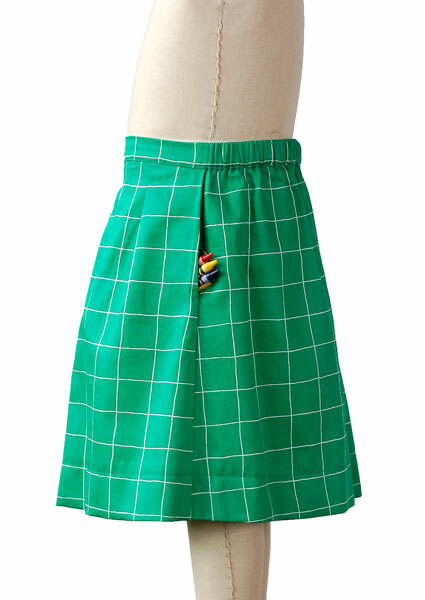 Culottes: Coordinating thread, lightweight fusible interfacing, approximately 18" of 3/4" elastic. Tee Chest 21 1/2" 22 1/2" 23 1/2" 24 1/2" 25 1/2" 26 1/2"
Tee Length, View A* 11 1/4" 11 3/4" 12 1/4" 12 3/4" 13" 13 1/2"
Tee Length, View B* 10 1/2" 11" 11 1/2" 12" 12 1/4" 12 3/4"
Culottes Waist, Relaxed** 18" 19" 19 1/2" 20" 20 1/2" 21"
Culotte Length at Side Seam 12 1/4" 12 3/4" 13 1/4" 13 3/4" 14 1/2" 15 1/2"
Tee Chest 27 1/2" 28 1/2" 29 3/4" 31" 32 1/2" 33 1/2"
Tee Length, View A* 14 1/2" 15 1/2" 16 3/4" 17 3/4" 18 3/4" 19 3/4"
Tee Length, View B* 13 3/4" 14 3/4" 15 1/2" 16 1/2" 17 1/2" 18 1/2"
Culottes Waist, Relaxed** 21 1/2" 22" 22 1/2" 23 1/2" 24" 25"
Culotte Length at Side Seam 16 3/4" 18" 19" 20 1/2" 22" 23 1/4"
I am in love with this top. My son is 5 and look so great in this shirt. And i can put some rocks and kleenex in the pockets. I will made a lot of those. Juste take about 2 hours. This pattern makes up so cute. I made them in a size 7 for my granddaughter . 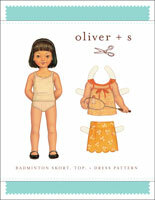 I hope to make her a pair in corduroy for this winter.I have been making Oliver & S clothes for her since she was a little girl . I made the cape , first . They are the best patterns. Cuffed sleeve T - shirt. I found the t shirt easy to sew as the instructions were very clear and I loved the way the cuff was attached. I did put a couple of hand stitches at the shoulder seam when the cuff was turned up. Based on the finished measurements I made a size 10 for my 8 and 10 year old granddaughters. The size 10 for the long lean 10 year old was great just abit short but the 10 for my more rounded 8 year old was a little snug and short. Lesson learn't as far as their particular shapes and preferences. I solved the length issue by adding a frill. We dress modestly which includes loose fitting, below the knee skirts/culottes. I often need to adjust patterns to fit our preferences. This one was perfect without any adjustments! Thanks for making my life simpler. The instruction are very well done and easy to follow. These will be great for a very active growing girl this summer. Thank you! Fabulous Pattern. Culottes were quite a complex sew, but great instructions helped me sail through! 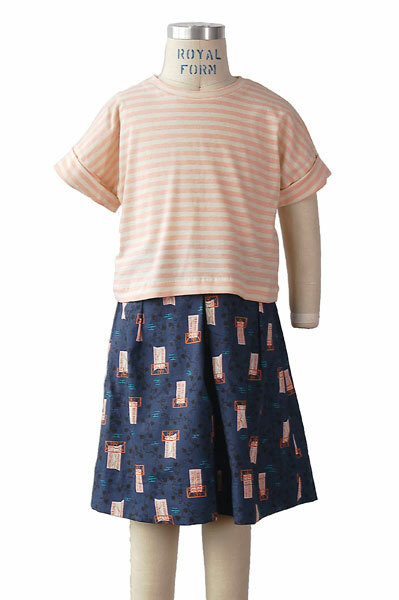 Especially love the simplicity if the Lunch Box Tee. My daughters love them both. 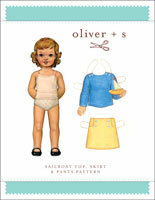 For a Uk based customer the patterns arrived quickly and with no problems at all. I only got my 1st sewing machine at Christmas and initially thought I was stretching my self too far. 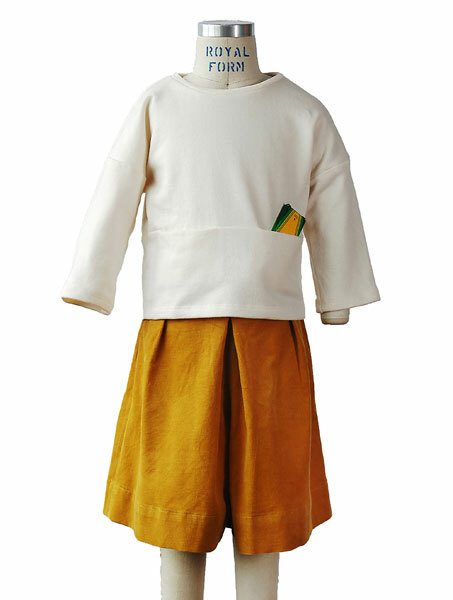 However the tutorials were great, the instructions fantastic and the end product looked really good, we've had lots of compliments (where did you get those being the main one) , the fit was brilliant and my toddler really loves the top ( toddlers love pockets) the culottes are perfect for busy children and so stylish.Thank you so much, I really enjoyed making them. I've made both pieces in size 4 and now size 5 for my 5 yo daughter and she practically lives in them. Great in wool suiting for a dressier look or linen for a more casual one, and now I finally have something worthy of the Nani Iro knits I've been hoarding. Such a lot of bang for the sewing buck, they're dead easy to make and have so much style. My kid is in a uniform most of the time so I don't like to 'waste' her free dress days on jeans an tshirts -- these are as comfortable and playground appropriate but so much more chic. Just made the top in the 12m size and it is ADORABLE. I sew that culottes in corduroy for my little girl (2 years old). Fits perfectly and sooo cute ! I absolutely love that pattern and sure will sew some pairs more (in wool and corduroy again, I already have the fabrics). 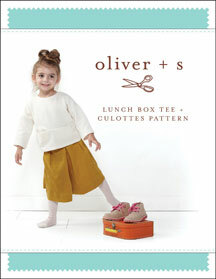 Discussion on the digital lunch box tee + culottes sewing pattern from the Oliver + S Discussion Forums. 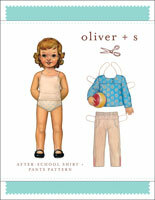 Find and share more photos on Instagram using the hashtags #lunchboxtee and #oliverands.